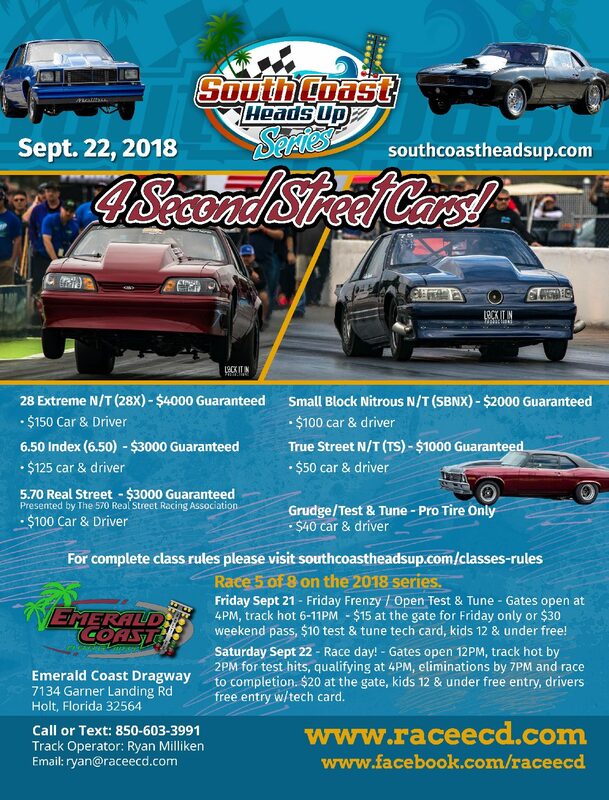 South Coast Heads Up is a small tire no time heads up racing series which is a joint venture between Triple X Racing, The Emerald Coast Dragway, Cottonwood Dragway and the Powerhouse Motorsports Park. We will have 8 races between the two tracks in 2018 and 3 classes running for championship points which we’ll celebrate at our year end banquet (date/location TBD). The classes listed below (click on link for class rules) will be running for points with the South Coast Heads Up Series. However each individual event may have other classes to run on race day, see event flyers for details. 28 Extreme (28X) $4000 guaranteed purse, $150 car & driver entry. 6.50 Index (6.50) $3000 guaranteed purse, $125 car & driver entry. 5.70 Real Street $3000 guaranteed purse, $100 car & driver entry – brought to you by the 570 Real Street Racing Association. Small Block Nitrous (SBNX) $2000 guaranteed purse, $100 car & driver entry. True Street $1000 guaranteed purse, $50 car & driver entry. All drivers who compete at SCHU sanctioned events in 28X/SBNX/6.50 will be automatically entered in the points chase. The vehicle (and the driver) being entered must be on premises. The same vehicle cannot be used for points (or competition) by more than one driver in the same class. Points are awarded to a driver in the class, not the vehicle. 10 points will be awarded for entering each points event. Entering a points event is defined as passing tech inspection with a vehicle (appropriate for the class entered) on the day of the event and turning in the tech card to the tower before the first round of eliminations. 10 points will be awarded to the winner of each round of elimination. 5 bonus points will be awarded to the event winner, 3 bonus points awarded to runner up and 1 bonus point to each semi-finalist.